When you’re dealing with a new cancer diagnosis for your dog, digging through treatment information is overwhelming. To make coping a bit easier, dog cancer vet Dr. Demian Dressler, DVM has done much of the work for you. UPDATE: Dr. Dressler’s acclaimed e-book is now included in his comprehensive Dog Cancer Kit! Dr. Dressler is known as the Dog Cancer Vet, and the author of The Dog Cancer Survival Guide. He is a traditionally schooled vet who has also practiced holistic canine cancer care for over a decade. Dr. Dressler believes in a full-spectrum approach to canine cancer that includes chemotherapy and/or radiation, as well as utilizing evidence-based alternative medicine. 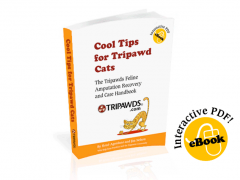 how to work with your vet to choose appropriate, beneficial treatments for your Tripawd. 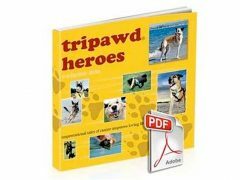 The Dog Cancer Survival Guide is a 283-page book that includes free bonuses valued at more than $150. Backed by a 60-day, 100 percent money-back guarantee, this informative e-book package is available for a 21-day trial for just $4.95. Read Jerry’s detailed review and see testimonials from other readers. The complete guide and video download normally costs $97.00 but is available for a limited time at just $37.00! Download the Dog Cancer Survial Guide today.